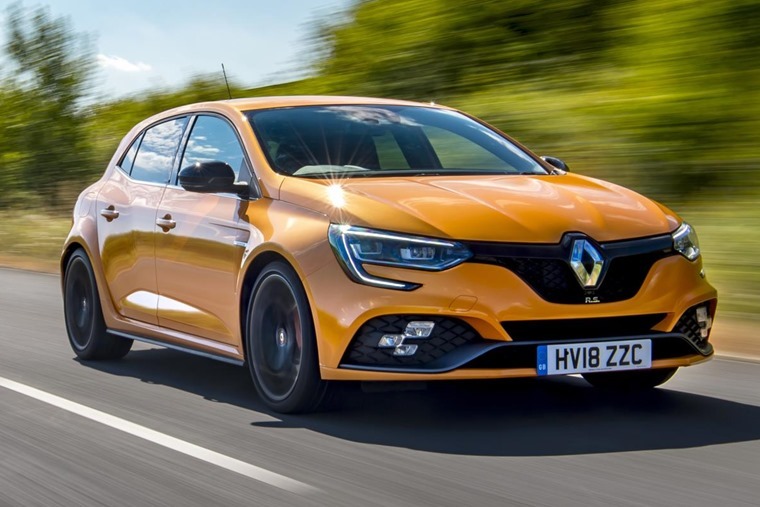 The Megane RS has traditionally been blessed with feeling more responsive than any other hot hatch and Renault has delivered on that front again. The suspension and steering are second to none. Few hot hatches have had to deal with such a weight of expectation as this third generation Renault Megane RS. Its predecessor was the benchmark for raw, exciting driving in the class, but a lot has happened since it bowed out. For starters, the Honda Civic Type R has become even more extreme in its power and driving delivery, while plenty of other rivals now match or beat the French car’s considerable engine figures. So, Renault’s fast hatch department had their work cut out to come up with something more than a bit special. What they have delivered is, in parts, brilliant. However, there are areas that don’t hit the same note. Some of them are inevitable due to the car being based on the standard Megane, so there’s no three-door variant for starters. Also, the cabin could be more exciting and we’re not wholly convinced by the look and interaction of the centre console’s large touchscreen. Renault has chosen to continue offering a traditional manual transmission with three pedals and all the fun that entails. The instrument cluster is another area where Renault hasn’t quite nailed it, with a mix of analogue and digital that doesn’t come across as completely cohesive. Still, the driving position is excellent, the seat comfortable and the steering wheel has just the right thickness to it. Choose a Megane RS with the EDC twin-clutch gearbox, though, and the paddles feel just a little lightweight and too far away from the driver’s fingers for intuitive changes. There’s better news on the gearbox front because Renault has chosen to continue offering a traditional manual transmission with three pedals and all the fun that entails. For some, this will be the default choice while others will prefer the EDC ’box for its ease of use and the race car feel it supposedly imparts. For us, the manual is the one to go for thanks to a quick, accurate shift and the greater interaction it affords with this hot hatch. The gearbox is connected to a turbocharged 1.8-litre petrol engine, which Renault tells is the most powerful motor of this capacity. That’s easy to believe when it kicks out 280hp at 6000rpm and a hefty 390Nm of torque spread between 2400- and 4800rpm. Use this to full effect and 0-62mph comes up in 5.8 seconds regardless of which gearbox you choose. That’s brisk by any standard in the hot hatch segment and matches the more powerful Honda Civic Type R. Yet there’s a lingering doubt that Renault has pulled its punch with this engine, and it’s a suspicion confirmed by the 300hp Trophy model that also comes with a lowered chassis and uprated brakes to cope with the added power and speed. 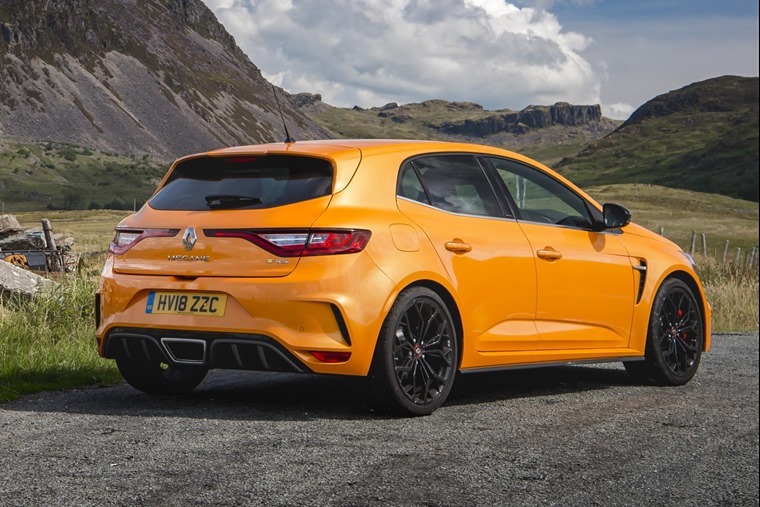 We’ve yet to drive the Trophy, which is only 0.1 second quicker from rest to 62mph than the standard Megane RS but we suspect the way it delivers its performance will be that little bit more visceral. 0-62mph comes up in 5.8 seconds regardless of which gearbox you choose. Renault has been here before with the very first Megane RS that also felt like it was only ever getting 90% of the good stuff. This isn’t to say the latest car is sluggish or not enjoyable to drive, it is, but the engine just doesn’t feel as lively as we’d hope for in a car from the RenaultSport works. So, is the Megane RS the car for you? Ah, well, we haven’t come to the real star of this show: the chassis. This is where RenaultSport has excelled in the past and they’ve done it again here. We can forgive the engine’s slightly muted feel when you have a suspension and steering set-up this good. This compliance delivers superb grip and traction into, through and out of corners without ever bothering the ESP system. Rather than go down the electronic damper route, Renault’s engineers have stuck with a more traditional arrangement and it works a treat. Yes, it’s a little firmer than a normal Megane in its standard Comfort setting, but stick it into Sport or Race and you’re treated to one of the best legal highs you can have on the road. It deals with bumps and rumps with a measured ease that only comes from years of experience developing springs and dampers for this work. In turn, this compliance delivers superb grip and traction into, through and out of corners without ever bothering the ESP system. If you go for the optional Cup model at £1,500 more, you get a limited slip differential that some might deem worth having, though it’s by no means a deal breaker. Every Megane RS is also blessed with steering that has more feel and response than any other in the hot hatch class we’ve tried. It lets you guide the car along the road secure in the knowledge with follow your instructions carefully and to the letter. The steering has more feel and response than any other in the hot hatch class we’ve tried. All of this is backed up and helped out by Renault’s 4Control four-wheel steer system that lets the rear wheels have a say in how the car reacts to steering inputs. At speeds over 37mph, it lets the back wheels turn slightly in the same direction as the fronts for greater stability. However, switch to Race mode and the rear wheels move in the opposite direction to the front pair to quicken up turn-in. It’s very effective in both settings and makes the Megane RS a quicker point-to-point car than any of its rivals on real roads. You can also choose between Sport and Cup chassis options, where the Cup is 10% stiffer and comes with that Torsen mechanical limited slip differential for added bite out of corners. Keen drivers would be well advised to tick this option. 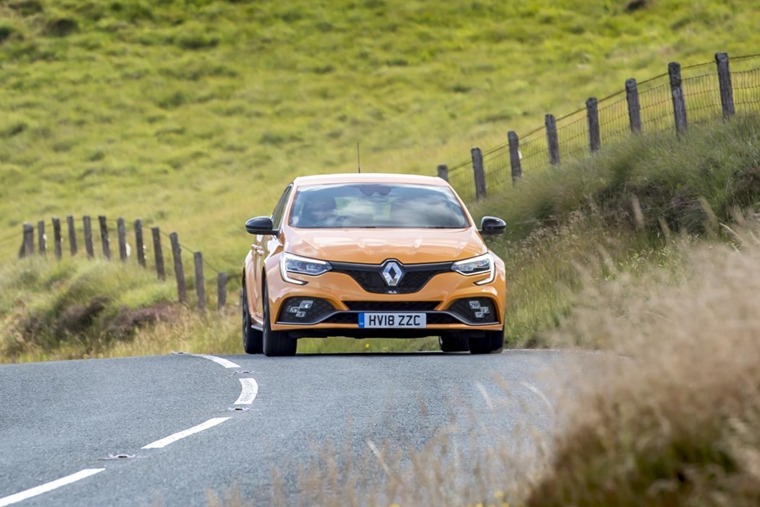 The way the Megane RS traverses back roads is what separates it from the herd and makes it worthy of consideration for anyone looking at a hot hatch. The lease rates are comparative to many rivals with similar power, and it’s kitted out with all the gadgets and comforts you’d expect at this level. Our one caveat is for drivers who want the ultimate fast Renault experience might be better holding out for the Trophy model. For everyone else, the Megane RS 280 is very good, though just shy of the definitive front-drive hot hatch we had hoped for. More subtle than some hot hatches (the Civic Type R springs to mind). Sets itself apart from standard cars courtesy of a rectangular single exhaust, funky chequered-flag lights and some great alloys. Excellent driving position and a comfortable place to be, although instrumentation is a bit hit and miss compared to key rivals. The Megane RS is blessed with a steering and suspension set-up that’s a cut above anything on the market. 4Control and Race mode make it a blast. It’s powerful, but practical too – there’s room in the cabin for four adults to travel in comfort, and 384 litres of luggage capacity is more than the Golf GTI offers. 40.9mpg is claimed when fitted with the six-speed DCT, while manuals are capable of a combined 39.8mpg.